The Zuttiyeh specimen from Israel (unknown date, but between 500-200ka) is extremely important, because it was found in a region of the world in which the earliest co-existence of modern humans and Neandertals is attested. As such, it may be part of a population that led to either (or both) of these species; the population divergence of the Homo sapiens and Homo neandertalensis lineages intersects the 500-200ka range of this specimen. 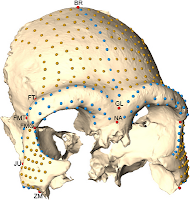 A recent paper in the Journal of Human Evolution studied Zuttiyeh using geometric morphometric techniques. Zuttiyeh (Zt) was compared with a wide range of other specimens from various periods, ranging from Homo erectus to modern humans. The PCA analysis is shown on the left. It is clear that Zuttiyeh clusters with Neandertals in Eurasia (open triangles), as well as "transitional" Homo sapiens from Africa (open squares: Florisbad Fl, 290-230ka from South Africa, and Jebel Irhoud 1 I1, 160ka from Morocco). On the left (filled triangles) are various specimens assigned to Homo heidelbergensis, the presumed common ancestor of modern humans and Neandertals. For more on this, see Chris Stringer's recent overview article. But, this is no simple ancestor species: rather, it encompasses skulls that are very old (Bodo Bd; Ethiopia ca. 600ka), and very young (Dali Dl; China ca. 200ka). 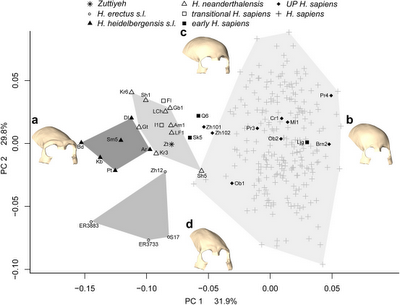 Indeed, Zhoukoudian 12 (Zh12; >500ka China) classified as Homo erectus appears quite modern in comparison to many of the heidelbergensis skulls. On the right (crosses) are the modern humans, including UP Europeans, as well as, intriguingly Liujiang (Ljg), a modern human from China that may be 119-139ka old according to the people who dated it, but at least 68ka old. If the latter date is accepted, this would be within the error bars of the major 70ka Event that may correspond to the earliest colonization of Eurasia. If the former, then Liujiang will join the Qafzeh 9 specimen as an extremely modern pre-100ka find from Asia. The Mount Carmel specimens (Qafzeh 6 Q6 and Skhul 5 Sk5; Levant 135-100ka) appear intermediate between H. heidelbergensis/H. neanderthalensis and H. sapiens but can usefully be called H. sapiens, since there are modern humans who appear as "left-shifted" as they are. Intriguingly, Shanidar 5 (Sh5; ca. 50ka) a Neandertal appears to be much closer to H. sapiens than to his Neandertal brethren (including contemporaneous Sh1). This seems to be in line with a recent analysis of shoulder blades in which Shanidar 3 was included, as was a contemporaneous Vindija Neandertal (= the source of the Neandertal genome). It may well appear that late Neandertals were not diverging away from a modern humans, but rather changing from the ancestral heidelbergensis state in the same way that modern humans are. A neglected possibility is that the late Neandertals, around the time of the apparent modern human Big Bang experienced gene flow from modern humans. This scenario was rejected in the original publication of the Neandertal genome on the basis of the idea that modern human admixture in Neandertals would have been modern non-African-like, because, presumably it was effected by a wave of Proto-Eurasians leaving Africa. But, if the Big Bang of human expansion occurred in Asia, perhaps in Arabia as it dried up post-70ka, as I have suggested, then modern human admixture could have affected late Neandertals. The groups were defined a priori according to the population grouping shown in Table 1. 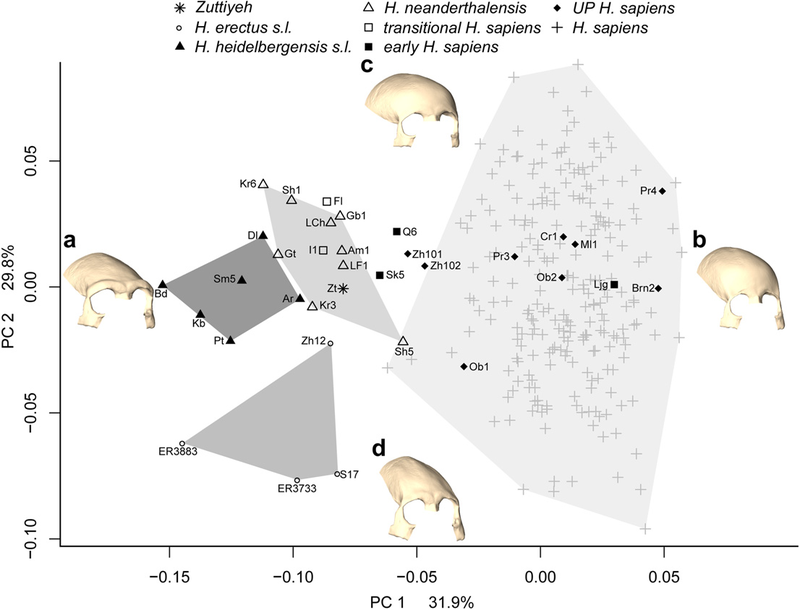 Zuttiyeh as well as all transitional (Jebel Irhoud 1 and Florisbad), early (Skhul 5, Qafzeh 6 and Luijiang) and Upper Paleolithic H. sapiens were treated as individuals with unknown group affinities to be classified by posterior probabilities. Florisbad appears to be quite distinct here, while Skhul5 and Qafzeh6 are clearly on their way to becoming modern; Zhoukoudian 101 joins this group (13-33ka), but is about 70-100 thousand years younger. Apparently the population of modern humans in Eurasia pre-100ka was widespread. Individuals of regular modern aspect appear post-70ka Event in both West and East Eurasia (Zh102 and Liujiang, assuming the latter is 68ka old). They probably appear in Africa as well probably in Africa as well. Sadly, neither Hofmeyr, nor Omo I/II and Herto were included in this analysis. All of the above are often mentioned in connection to modern human origins. So is Kabwe (Broken Hill; Homo rhodesiensis) which is listed here as 700-400ka but may in fact be much younger. Jebel Irhoud 1 a "transitional" Homo sapiens from Morocco seems to have a long way to go to transition to a fully modern shape. Both Amud 1 (Am1; a big-brained late Neandertal from the Levant 50ka) and the aforementioned Shanidar 5 appear just as modern as Irhoud 1. Zuttiyeh appears linked to Neandertal and transitional H. sapiens. It is unclear where to place it, except to say that it is an archaic-looking human who is in the process of evolving in the same direction that both Neandertals and modern humans did. There does not appear to be any good evidence in this data that H. heidelbergensis underwent a split that led to modern humans and Neandertals. On the contrary, often younger skulls appear more archaic than older ones, and skulls from the same period/region seem to occupy different positions in the archaic/modern range. Even during the last 50ky, there seems to have been elevated diversity in modern humans. Zhoukoudian 101 from this study appears to be one example of unusual morphology for so late a specimen; recent discoveries from China and Sub-Saharan Africa point to the same phenomenon. I continue to think that within the Homo heidelbergensis lineage there was progress towards more modern forms throughout the old world. But, this progress did not replace the older forms; nor did it materialize as obviously divergent lineages. The last few hundred thousand years appear very much like a serious of experiments that lead in some vague way to something akin to us. There probably was a long, drawn-out road to us. In Africa, the Near East, and Asia, there was a co-existence of quite divergent forms; even Europe, long-considered the exclusive abode of Neandertals, there apparently lived humans that did not possess the derived Neandertal morphology. The simple story of our origins is that our common ancestor H. heidelbergensis split into an African and Eurasian lineage that eventually evolved into H. sapiens and H. neanderthalensis, and finally the former replaced the latter, with perhaps a little admixture along the way. It would appear that aspects of modernity appeared throughout the Old World during the last few hundred thousand years. 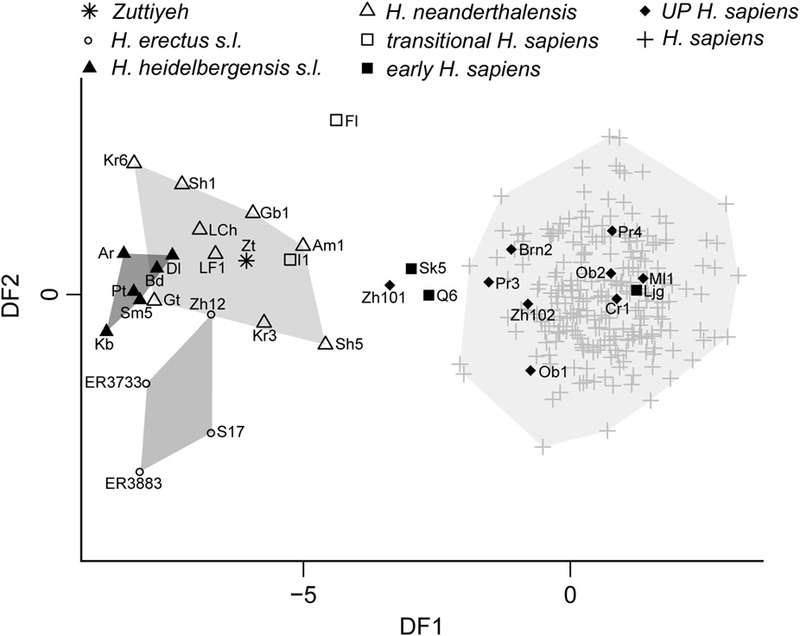 Perhaps (as the multi-regionalists would have it), this was facilitated by gene flow between distant human groups; alternatively, H. heidelbergensis already had the seeds of his future evolution, and similar solutions were found for similar selective pressures independently. For the time being, we must probably accept the fact that a great variety of human groups of the last 500,000 years at least have contributed to modern mankind. Only isolated groups like Homo floresiensis who disappeared before having the chance to affect us may have escaped the honor of being our ancestors. But, it also seems that much of our ancestry does come from a unique population emerging somewhere within that broader milieu. Where this population lived and why it became so successful is an open problem, but, until there is evidence to the contrary, I would say that my two deserts theory, as elaborated here, may be a reasonably candidate. The Zuttiyeh hominin craniofacial fossil was discovered in Israel in 1925. Radiometric dates and the archaeological context (Acheulo-Yabrudian) bracket the associated cave layers to between 200 and 500 ka (thousands of years ago), making it one of the earliest cranial fossils discovered in the Near East thus far. Its geographic position, at the corridor between Africa and Eurasia, in combination with its probable Middle Pleistocene date make it a crucial specimen for interpreting later human evolution. Since its discovery, qualitative descriptive and traditional morphometric methods have variously suggested affinities to Homo erectus (Zhoukoudian), Homo neanderthalensis (Tabun), and early Homo sapiens (Skhul and Qafzeh). To better determine the taxonomic affinities of the Zuttiyeh fossil, this study uses 3D semilandmark geometric morphometric techniques and multivariate statistical analyses to quantify the frontal and zygomatic region and compare it with other Middle to Late Pleistocene African and Eurasian hominins. Our results show that the frontal and zygomatic morphology of Zuttiyeh is most similar to Shanidar 5, a Near East Neanderthal, Arago 21, a European Middle Pleistocene hominin, and Skhul 5, an early H. sapiens. The shape differences between archaic hominins (i.e., Homo heidelbergensis and H. neanderthalensis) in this anatomical region are very subtle. We conclude that Zuttiyeh exhibits a generalized frontal and zygomatic morphology, possibly indicative of the population that gave rise to modern humans and Neanderthals. However, given that it most likely postdates the split between these two lineages, Zuttiyeh might also be an early representative of the Neanderthal lineage. Neanderthals largely retained this generalized overall morphology, whereas recent modern humans depart from this presumably ancestral morphology. Dieneke, will you do a model-based clustering analysis of these skulls (and more) like the ones you did before? "It may well appear that late Neandertals were not diverging away from a modern humans, but rather changing from the ancestral heidelbergensis state in the same way that modern humans are". "Zuttiyeh appears linked to Neandertal and transitional H. sapiens. It is unclear where to place it, except to say that it is an archaic-looking human who is in the process of evolving in the same direction that both Neandertals and modern humans did". "There does not appear to be any good evidence in this data that H. heidelbergensis underwent a split that led to modern humans and Neandertals. On the contrary, often younger skulls appear more archaic than older ones, and skulls from the same period/region seem to occupy different positions in the archaic/modern range". In fact what seems to happen is that Neanderthals and 'modern' humans are just two of several regional varieties of H. heidelbergensis. "The simple story of our origins is that our common ancestor H. heidelbergensis split into an African and Eurasian lineage that eventually evolved into H. sapiens and H. neanderthalensis, and finally the former replaced the latter, with perhaps a little admixture along the way". "Modern humans appear distinctive, with their closest pre-100ka relatives being the Mt. Carmel hominins from the Levant (Skhul and Qafzeh), as well as, intriguingly, late Near Eastern Neandertals (Amud and Shanidar)"
I agree with you that that argues in favour of some level of Eurasian origin for modern humans. And a wide expansion of a particular gene combination at some relatively recent period. "There probably was a long, drawn-out road to us". Yes. No sudden expansion of some vastly superior species that replaced all other closely related species. There is a difference in time scales: Neanderthals appear to diverge starting some time around 350,000 ya and seem to be fully formed by ~150,000 ya - the latter date being closer to the start date in the formation to fully modern human skulls. In fact, if the dating of 200-500ka is correct, that is the most surprising finding: that Zuttiyeh is rather modern. 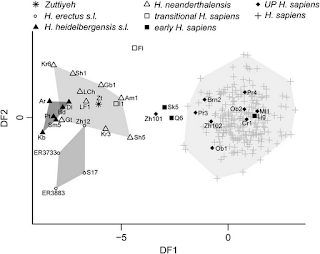 At any rate, I don't believe in a pan-Old World Heidelbergensis continuum - Denisova tells us otherwise. I still believe that Nenaderthals were largely relegated to Europe, with the occasional spill into the Levant and a single very late one all the way to Iran, while (fossils unfortunately missing) Heidelbergensis continued in Asia (and erectus in SE Asia). But, yeah, the near East was definitely a good region for mixing, including African groups. I just doubt that after Heidelbergensis, that gene flow made it far away from that area (given anatomic and DNA results, so far). "Neanderthals appear to diverge starting some time around 350,000 ya and seem to be fully formed by ~150,000 ya - the latter date being closer to the start date in the formation to fully modern human skulls". But Neanderthals became fully formed in Europe, and 'modern humans became fully formed in Africa/Arabia. The dates are basically irrelevant as I would not expect the various geographic varieties of any species to form spontaneously. Besides which the two subspecies (or whatever we may wish to call them) diverged much earlier than the time that either became fully formed. "In fact, if the dating of 200-500ka is correct, that is the most surprising finding: that Zuttiyeh is rather modern". I agree that it is surprising under the conventional view of human evolution, where it is believed that some suddenly superior species was able to rapidly expand considerably at the expense of all closely related species. However it makes complete sense under a gene flow model of human evolution where change toward modernity would be gradual (punctuated equilibrium?). "At any rate, I don't believe in a pan-Old World Heidelbergensis continuum - Denisova tells us otherwise". As doeas common sense. Virtually all widespread species show geographic variation, to some degree at least. Some considerably so. It would be extremely surprising if H. erectus/heidelbergensis did not similarly display geographic variation. "I still believe that Nenaderthals were largely relegated to Europe, with the occasional spill into the Levant and a single very late one all the way to Iran"
I agree absolutely. In fact it seems likely that Neanderthal presence even in the Levant is later than the appearance of 'modern' humans there. Of course it is possible that they periodically managed to reach the region during times of cooling climate. "while (fossils unfortunately missing) Heidelbergensis continued in Asia (and erectus in SE Asia)". I very strongly suspect that elements of heidelbergensis (or something similar) made it into SE Asia. H. erectus there seems to move somewhat towards 'modernity' even in that remote region. "I just doubt that after Heidelbergensis, that gene flow made it far away from that area (given anatomic and DNA results, so far)". But mt-DNA and Y-DNA demonstrate huge expansions since heidelbergensis. And I think it very likely that many of us under-estimate ancient humans' mobility. "It would appear that aspects of modernity appeared throughout the Old World during the last few hundred thousand years." Am in agreement on this.